Good and Evil. Can people really be sorted into just these two categories? As good saints and evil monsters? Is it just that simple? Do people become monsters by their own choice? Or is the circumstances that push them into the dark abyss of evil? Based on Naoki Urasawa's manga with the same name, Monster is a brilliantly orchestrated 74 episodes long mystery psychological thriller. The story starts off with Kenzo Tenma, who is a brilliant neuro-surgeon at a prestigious hospital in Germany. Everything is going good for him until one day he has to choose between saving a young boy or the town's mayor. Since, Tenma is a very honourable man who believes in his ideals more than anything, he chooses to save the boy's life. Despite making that 'morally correct' decision, he is demoted from his position. Not only that, his world is turned upside down when a few of the doctors at his hospital are murdered and everything points towards that boy he saved. Tenma then starts questioning his own beliefs as he is the one who brought that 'monster' back to life. 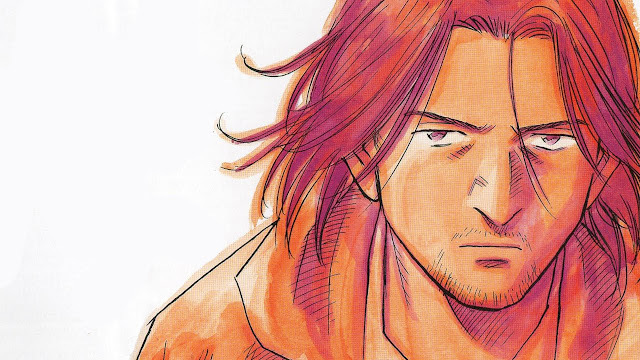 The rest of the show revolves around Tenma as he sets on a journey to find the real identity of the boy and uncovers some ugly truths in the process. The only down-point in the story is that it switches perspectives a little too much at times. A slow paced show like this takes a little time to get you engaged, and for the first few times, leaving the current story at a cliffhanger and switching the narrative to a different character feels okay (and even refreshing at times), it gets a little frustrating when it happens too often. Besides that, the story is nearly perfect. In terms of pacing, monster moves like a slithering snake, slow but very smooth and carries this eerie vibe with it which instils a sense of fear in the viewer with it's horrifying and sometimes 'ugly' themes like infidelity, child abuse, mass murder, prostitution and racism. The show does not go easy on the viewer when showing them these themes. It shoves that harsh reality of the world right in your face and completely shatters the naive common beliefs like "If you do good things, good things will happen to you". It shows how someone can become a "Monster" because of their circumstances or how someone can be "manufactured" to be a monster. The show has this dark and saturnine environment right from episode one, and it stays that way throughout the course of 74 episodes. It is quite different in that way considering that most anime tend to have at least some sort of comic relief thrown in them. So, people looking for a fast paced psychological thriller (like Death Note) will be disappointed. Since Tenma sets out on a journey, there are a quite a few side stories spread across the show. All these stories are nicely executed and some of them even tie up into the ending. As a result we have quite a lot of characters in our character pool. It's pretty amazing how almost all of them are nicely fleshed out. During the course of each side story, we come across a different theme everytime and every single one of these stories change Tenma as he tries to save a character from falling in the abyss of evil or simply save their lives. There are times when you will be absolutely disgusted by some of the characters or times where Tenma's actions will surprise you. Speaking of Tenma, he comes out as a totally different person at the end of the show as each layer is added in his character at the end of every story. Not only that, two other characters, namely Grimmer and Lunge, change completely and they are one of my favourites now. None of the main characters are stereotypical cardboard cut-outs, in fact, everyone of them is developed to the extent that they almost seem like a real person. The way they react, their expressions, their stories, everything is consistent and shows that Naoki is a genius when it comes to characters. I have purposely avoided talking about our Antagonist Johan Liebert because explaining his character would spoil a lot of the series. Though I will tell you this, he is probably the best villain when it comes to how much off-screen influence the guy has in the show. His demeanour, his character design, the way he talks, how he works through the shadows, everything builds up this scary image of him that when he does come on screen, you can feel his presence. Now, a slow paced dark show like this needs to look dark and dull. And Madhouse has done a good job at that. The best part about the whole thing is the character designs. The facial proportions and physical build of the characters is pretty close to being realistic. The character movements are quite fluid and consistent and the scenery just looks amazing. If I have to define what 'class' is in psychological mystery anime, I would definitely use Monster as an example. It isn't a flawless masterpiece, but for it's genre, I'd say it's pretty close to being one. So, would I recommend this to everyone? Yes but with a little warning. The show is quite slow and it can get quite dark at times and maybe even horrifying considering the themes that it explores. If you're just a beginner, don't watch it right now, add it to your watch list. But if you like dark shows that slowly build up to an epic climax, this one is for you. I'm House, and if you enjoyed reading this review thank you. (If not, thanks anyway for reading.) If you would like to enjoy more, you can go check out my blog. I am your average anime viewer/gamer who loves to write in a very catchy chillaxin' stream-of-consciousness style.